Nike is once again ready with a new colourway, and It’s time for the Always Forward Pack, which is going to help you through the cold and hard winter season. The new Always Forward Pack contains new striking colour for the 4 main silos. Let’s see what Nike has in store for us with this awesome winter pack, which the pro players are going to use! The is only one way and it’s Always Forward. Your game has no boundaries, so strike your opponents with speed or choose to control the game with precision, the choice is yours. There is not time to hesitate on the pitch or to give up, it’s now you have to give all that you have, never stop, move the game, Always Forward. The main theme colour for the Always Forward Pack is blue and black. The colour combination is something that suits the dark and cold winter months, when it’s getting biting cold and darker days. The PhantomVSN is made in a predominantly blue colour, with black branding and a silver control zone on the inside of the boot. This boot will surely make you fell calm on the pitch, while you control and pick off your opponents one by one, just as Coutinho and Kevin De Bruyne is going to do. You will be the main cause to moving the game forward, when being the Phantom of the game, with your PhantomVSN on your feet. It’s also been a long time since we last time saw new colours for the Hypervenom and Tiempo, and the waiting is over. If you are looking for a subtle and comfortable boot, then the Tiempo Legend is also updated with a blue and black colourway. The Legend seems even more royal with this stylish royal blue coloruway and black branding on the side. Comfort and control are the keywords for the Tiempo, and you will see Sergio Ramos and Pique control the defense in their battle to keep the attackers from scoring. The Hypervenom is made for the most lethal attackers in the game, and at the moment we see several unstoppable attackers dominating the game. But when looking at this new colourway one attacker pops up in my mind, and it’s the lethal Inter Attacker Mauro Icardi, who is scoring his name into people’s mind with his performance. Personally, I can’t wait to see the blue and black Hypervenom combined with the Inter 2018/19 Home Shirt and seeing Icardi finishing off the opponents with his lethal strike. If blue isn’t your colour, then you’re in for a treat. 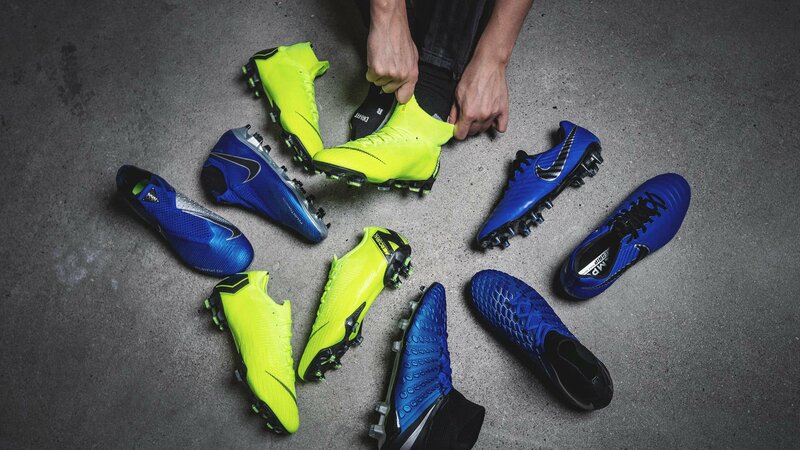 The most eye catching colour of the Always Forward pack is without a doubt the Mercurial boots. The Mercurial silo is made in a striking volt colourway, so you can play with fury on the pitch, while creating chaos on the opponent’s half. No one is going to stop Hazard, Ronaldo and Mbappé move forward, while they are in the zone with their new Mercurial boots. There are no speed limits, just blaze past your opponents with your speed. The winter season also means the start of the indoor and futsal season. You can now also get your favourite Nike Always Forward boot as in indoor boots, so you can dominate the indoor and futsal courts with the latest technologies and colourways. The boots come with the same technologies in the upper, while Nike has replaced the studs with indoor optimised soles, so you don’t slip on the courts, and lose important momentum, so you Always move Forward. If you want to be ready for the winter season, then you can get your Nike Always Forward boots at Unisport from Wednesday the 17th of October. If you want to get your own pair, then sign up right here and get notified when they are online.